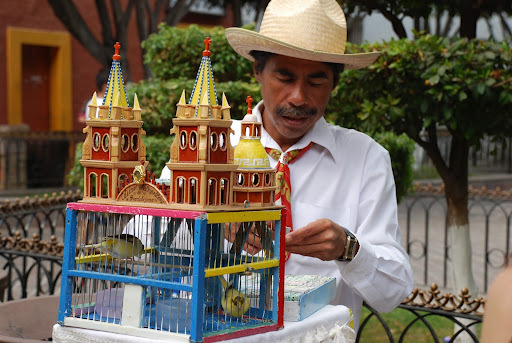 Fortune-Telling Birds/Canarios de la Suerte | ¡VidaMaz! 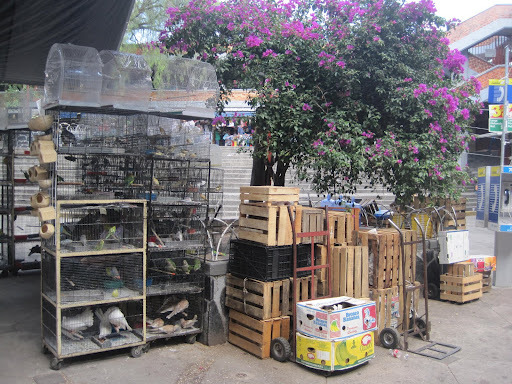 We saw fortune-telling birds in Tlaquepaque on our last visit. 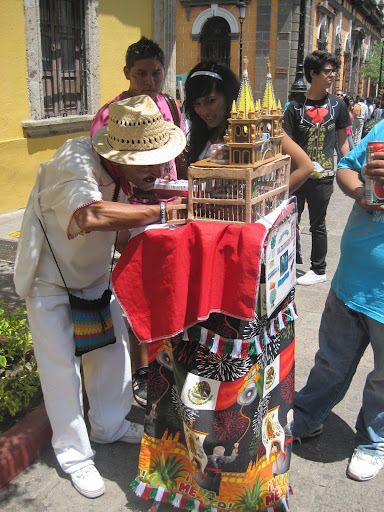 This time we saw them in the historic center of Guadalajara. The wooden cages were beautiful little castles and most of the “augers” dressed traditionally; it was a charming scene that appeared to be a tradition. So, of course I just had to give it a try! It was mid-morning. 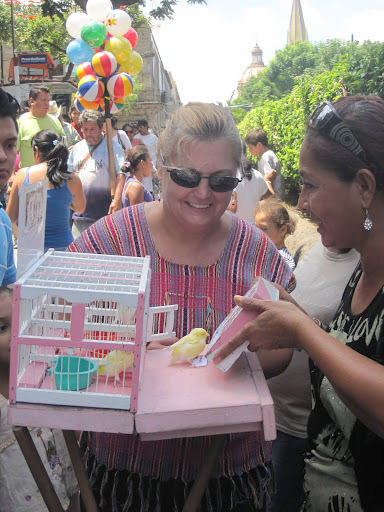 The street vendor asked me what I’d like to know: did I have questions about love, health, wealth… She said it would cost me 10 little pesitos. But, I wasn’t sure what to ask about. She asked me my name, and I told her it was, “Diana.” She then had the bird choose five fortunes for me, which I guessed to coincide with the five letters of my name, each chosen from a different area of the little box with folded paper fortunes. One of these papers she handed me to read right away. It was titled, “Anuncio de Vuestro Porvenir.” I of course got the “Especial” (as no doubt does everyone), which told me I was intelligent and noble-hearted, would have riches, love, friends and luck, and that my pain would dissipate. Not bad! She wrapped another of the papers in gold foil and taped it closed (it’s titled, “Horoscopo Planetario”). Then she wrapped the first one around the one in gold-foil, and instructed me not to open this “special” fortune until after 3:00 pm that day. When I got home I tried to do a bit of research on this interesting tradition. I learned that sometimes the fortunes are called “”tonali,” a Nahuatl word for destiny or fortune. In ancient times infants’ names were entered in the Tonalmatl or Book of Fate. 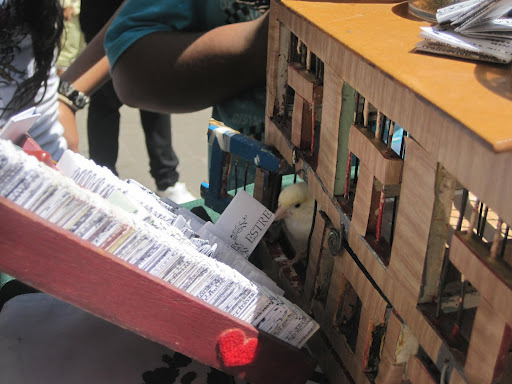 I have seen birds choose fortunes elsewhere in the world (Hong Kong, India, elsewhere in Latin America), including pecking a stick or a paper with a number (the number corresponds to a paper fortune chosen from another, numbered stack) or a tarot card. So, I was curious to know where the birds-as-fortune-tellers tradition originated, and how it travelled worldwide. My internet research, however, was not extremely fruitful. I found bits and pieces and nothing very comprehensive—a good project for someone with more time, talent and interest than I have! 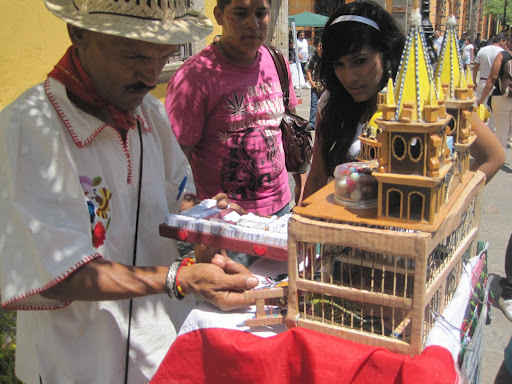 ornithomancy (predicting the future by observing the natural patterns or changes in the patterns of birds). Augury (derived from the Latin word for “bird”) seems to be generally used to refer to the use of birds for divination. I read that it was first systematized by the Chaldeans, and popular among the Greeks and Romans. I also read references to ancient Egypt and the Druids. So, it’s a tradition that’s obviously been around a while! Romulus, the second king of Rome, was an auger and started a college of augury around 300 BC. Supposedly no major military battles or matters of state were entered into in ancient Rome without consulting the birds. Something that struck me during my several hours of research was that there did not appear to be general agreement on where the practice of birds as fortune-choosers originated, nor on where the birds used in this practive originated. 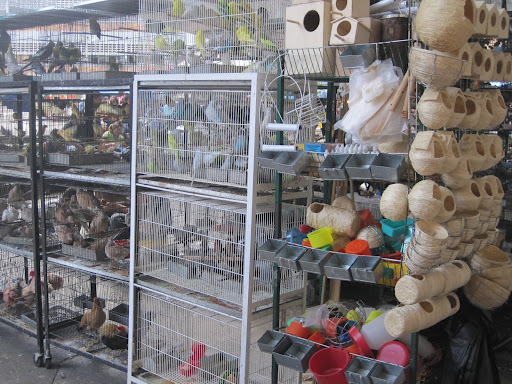 According to one scholarly article I found, Columbus took American parrots to Spain in 1493. 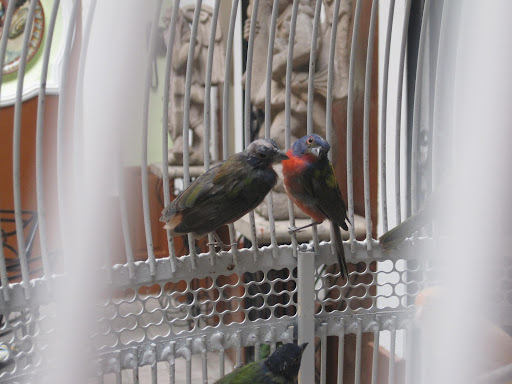 The Portuguese took the birds to India (from whence they were later re-introduced to Europe). My guess is that of course other species originated in other areas of the globe, and were likewise transported. 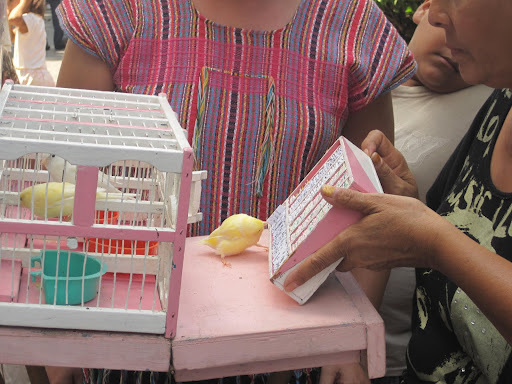 My brief research does lead me to believe that the use of birds as fortune tellers is gaining popularity in response to the desire to supply tourists with a unique and fascinating experience. In those places where this has indeed been a local tradition, it would strike me as a terrific way to carry it on. And, my guess is that it has taken root in other areas as a street-vending/money-making opportunity, which is not bad, either. In addition to what I’ve noted above, there is a whole literature on birds as omens, birds in the tarot, etc. I was really researching the practice of birds used to choose or tell fortunes for pilgrims or paying customers. 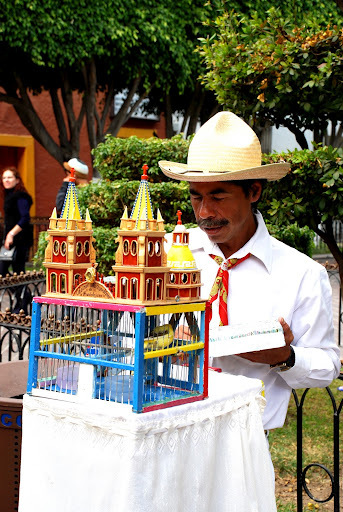 I did love that there were so many song birds all over Guadalajara. Every market sold them, and it seemed every restaurant had them. Below are a few closing photos. PS, are you from Barcelona, Ruben? Or Mexican? I LOVE Barcelona, especially the parque del amor and all the Gaudí influences. I studied at Univ. de Salamanca hace muuuuuuchos años. Hi Diane. I am Mexican, but I have been living in Barcelona for the past 8 years. I'm about to go to Manchester for a presentation on this very subject. Right now I'm pursuing a Chinese origin hypothesis. That sounds wonderful, Rubén. What conference is it in Manchester? Will they issue proceedings or film or record your session? We would love to meet you via sight or sound, and learn more about this, if so. Buena suerte!